About three years ago, Barb Stauffer and Leah Monaghan were making unique flavored popsicles for their kids. “We could envision each flavor we created in a cocktail instead,” Stauffer says with a laugh. “We were excited about the opportunity to create unique flavors that could help us easily make craft cocktails at home,” she explains. So the two tested the concept with a group of friends and it was hit. And with that success their product, ROOT 23: Simple Syrups, hit store shelves in June 2015. 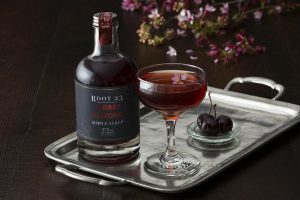 ROOT 23 produces all-natural simple syrups in unique flavor combinations that can be used to easily make craft cocktails or non-alcoholic drinks. Stauffer explains how they mix great with your favorite spirits, or can simply be added to sparkling water, coffee, lemonade, or tea to enhance the flavor. “We offer all of our flavors in a 12.7 oz bottle and we also have a sampler pack with four 4 oz. bottles, which feature the flavors seasonally,” details Stauffer. Their most popular flavor is Cucumber Habanero which makes a great spicy margarita, Bloody Mary or Moscow Mule. Each flavor compliments different spirits and can be used to enhance traditional cocktail recipes or easily create new ones. 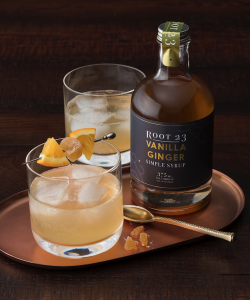 You can find ROOT 23 at many local markets like Weiland’s and The Hills Market, wine & spirit shops, plus some larger stores like Giant Eagle Market District and Kroger. You can also check out a list of all the stores that carry ROOT 23 on their website: click here. You’ll also be able to catch ROOT 23 at the Ohio Made Holiday Market on November 11th at The Hollywood Casino. Learn more about these simple syrups by visiting online at www.ROOT23.com. And follow along on Facebook and Instagram: @root23_simple_syrups. This time of year Stauffer says they love to batch up warm cocktails in a crockpot for tailgate/football parties. “Simply mix apple cider with either bourbon or spiced rum, then add our Maple Cinnamon or Vanilla Ginger syrup and warm in a crockpot. You can garnish with fresh apple slices,” Stauffer says.